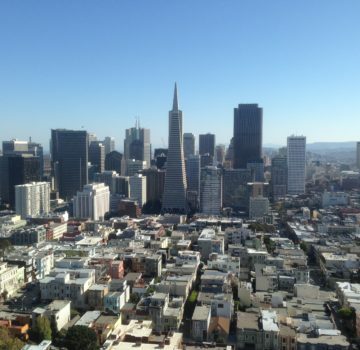 A few weeks ago I attended a meeting in downtown San Francisco. Of course I was pleased to participate in the meeting, but I was equally interested in visiting San Francisco for the first time. A number of my friends have lived there and argued that it is one of the best cities in America. I had to see for myself. Unfortunately, I only had two half-days following my meetings and before my flight home to Chicago. My tour began on a beautiful 70-degree Friday afternoon with a friend pointing me in the direction of the Ferry Building. Departing from our South of Market meeting location, I walked down Market Street taking in all the bustling city activity that you’d expect in any vibrant business district. Opposite The Embarcadero from the Ferry Building some ad hoc vendors were set up in place of the Ferry Plaza Farmer’s Market. The marketplace extended inside the Ferry Building, aptly named for its role as terminal for many bay ferries past and present. 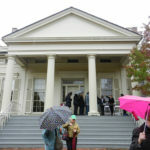 I was impressed with the renovation of the historic building constructed in 1898. The steel-framed structure accommodates a large interior merchant corridor and a continuous central skylight. 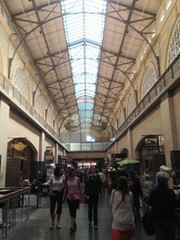 The designers have done a good job of preserving both the architecture and the atmosphere of the historic marketplace. Standing near the western abutment at the Ferry Building, it seems somewhat unfair that the Golden Gate Bridge receives disproportionate attention. The Bay Bridge suspension bridge is pretty impressive in my estimation. However, the engineer’s calculation to save cost and ensure stability placed a large cylindrical concrete pier at midspan of the main 4,100 ft. span. This acquiescence to the forces of nature removes some of the magic from the bridge. As if an effort to make up for this visual shortcoming, the suspension cables have recently been outfitted with thousands of LEDs which put on a digital light show for downtown San Francisco each night. Continuing on from the Ferry Building, I caught word of ferries departing for Alcatraz further along waterfront. On the way, I passed several large piers jetting into the bay. Although there is much architectural consistency between the piers, each have a unique history. Today, the piers are being redeveloped for many different uses, including office space, cultural centers, and high-tech industry. The historic buildings provide a huge covered area in some of the most valuable real estate in the city. The Alcatraz tour outfitters were location along one such pier. But alas, I was several days late in registering for that day’s tour. Note to the San Francisco traveler; book you Alcatraz tickets online at least a week in advance. I contented myself with reading about the island’s history and structure from the model in the waiting area. You can still get a pretty good view of Alcatraz from a number of piers including Fisherman’s Wharf. Taking one of many bay boat tours is also a possibility, but I had too much yet to see in my limited time. I continued on toward more of the typical tourist destinations. Pier 39 is home to a herd of boisterous seals and the full collection of over-marketed brand name tourist kitsch that I had thought San Francisco would be too cool for. Continuing along The Embarcadero, there are some older establishments that have at least a little nostalgic appeal. 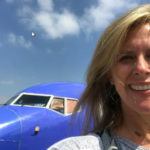 Onward to Ghirardelli Square, I thought the renovation of the old chocolate factory was well done, but I wasn’t in the mood for gorging on chocolate. I had hoped to ride the cable cars for an ‘authentic’ San Francisco experience, but there was a huge line and apparent delay at the Powell/Hyde turnaround. It hadn’t occurred to me that the turn around would be a special turntable, but it makes sense. Construction of the first cable car lines in San Francisco began in 1873, based on technology developed to haul ore from mines. However, after the Great Earthquake and Fire of 1906, electric streetcars became the more economical solution for most roads. A few cable cars remain on the steepest streets but more so today for their historic, cultural, and tourist value. I quickly took a city bus to my next destination. I have a thing about getting to the highest point of a city when exploring. It’s almost always worth the climb. Coit Tower rests on the crest of Telegraph Hill just outside the central business district. All afternoon, I could regain my bearings by looking up to the art deco monolith. I chose the most direct route, which involved an unexpectedly tough climb. I couldn’t believe that cars were parked on the steep Filbert Street. It felt like a 30-degree grade! Steps and grooves were carved into the sidewalk to help. Along the way I passed a couple septuagenarians calmly making their daily climb with groceries. I picked up my pace. 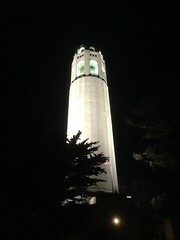 Coit Tower was built in 1933 at the bequest of Lillie Hitchcock Coit. It’s remarkable that the elegant concrete structure was left unclad, demonstrating the stoic qualities of cast-in-place concrete. The interior, however, was canvased in murals by 27 different artists and numerous assistants. The main attraction for me was the opportunity to get an even better view of the city, and for another $7 elevator fee, it did not disappoint. To the north and west I could see San Francisco Bay, Alcatrz Island, and even the hazy outlines of the Golden Gate Bridge. To the south and east lay downtown – including my best view yet of Transamerica Tower, the iconic pyramid shaped skyscraper. My afternoon was all downhill from there, literally. I walked down Stockton Street through Chinatown. That was a fun experience. The large immigrant community still appears to maintain traditions, including that of shopping for unfamiliar-to-me sea creatures, plants, and remedies in the many storefront markets. It all seemed very authentic, though at that point I was a little disappointed not to find an Americanized bubble-tea stand. Finally, I arrived back in Union Square, close to my starting point and my hotel. Once the rallying point for support of the Union Army during the Civil War, it’s now the hub of the downtown shopping and theatre district. After a very long walk, I was very happy to meet a friend in a nearby Irish pub for a well-earned pint. 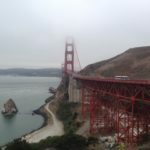 Your article brought back fond memories of the visit to San Francisco that I made last year after presenting at the NYC Bridge Conference. My wife and I took a short detour from LA on our way back to Australia. We found it a great city and loved the old trams going up and down Market Street. We also took a couple of public buses to the Golden Gate Bridge (maybe you do that in Part 2). A walk on the bridge is such a sublime experience, that I recommend it anyone visiting the city.